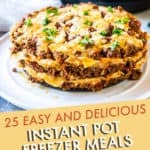 These 25 Instant Pot Freezer Meals (plus bonus dessert!) are delicious, easy to make, and ideally suited for storing in the freezer till needed. Includes meals that are suitable for a wide array of dietary trends, such as vegan, low carb, gluten free. Weight Watchers points also listed in each recipe. Friends, I am all about planning ahead. Especially when the goal is to make my life easier. And meal prep is one of those things that saves me time (and saves my sanity) when I need it most. But even when I need to pull together a meal with almost zero time and effort, I still want it to taste delicious. 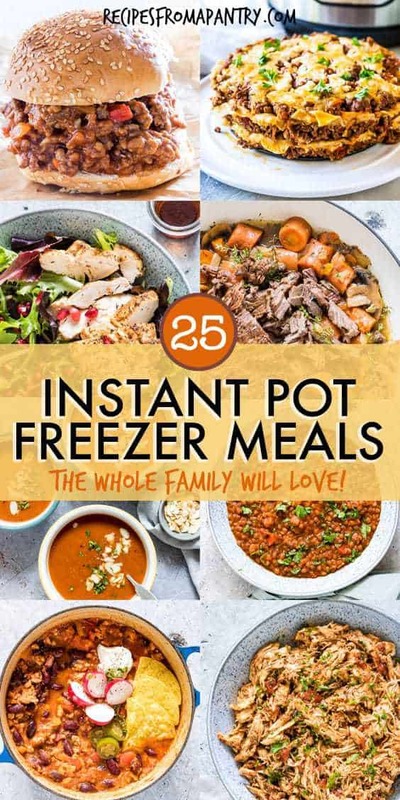 Which is exactly why I’ve put together this collection of 25 Instant Pot Freezer Meals (plus a bonus freezable dessert!). 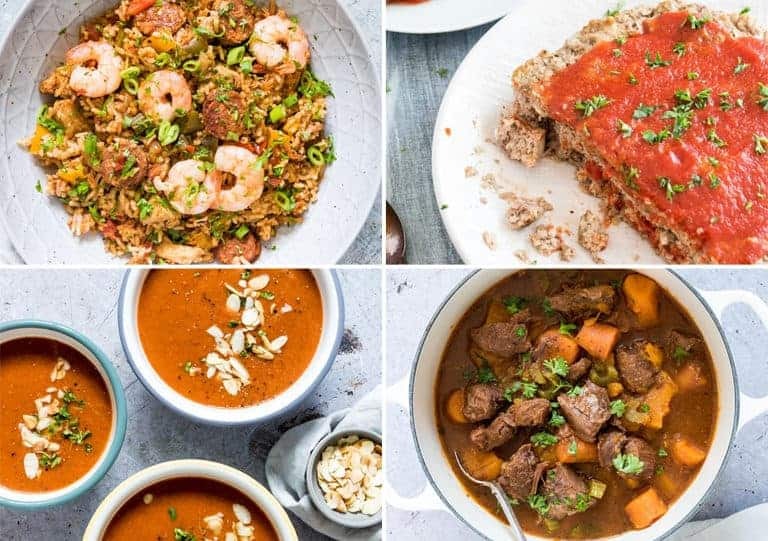 Each and every one of these Instant Pot recipes is simply packed with flavour. And thanks to the wonder that is the Instant Pot, each one is sooooo quick and easy to make, and even easier to store in the freezer, reheat and serve when needed. Takes the guesswork out of dinnertime. The only question I dread more than “are we there yet?” is “what’s for dinner?” Especially on those hectic weekdays when I haven’t had a moment to think, much less plan our meal and shop for the necessary ingredients. 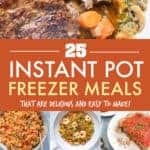 Having Instant Pot freezer meals on hand makes it simple and easy to decide what to serve. And no emergency trips to the market necessary! It is healthy “fast” food. When you have a well-stocked freezer full of Instant Pot meals, there’s no need to resort to fast food or calling for takeaway. You can easily thaw and heat up a healthy, delicious home cooked meal in less time than it takes to order out. Save money. With a little bit of planning, you can really stock up when your favourite staples go on sale. Good price on chicken at your local market? 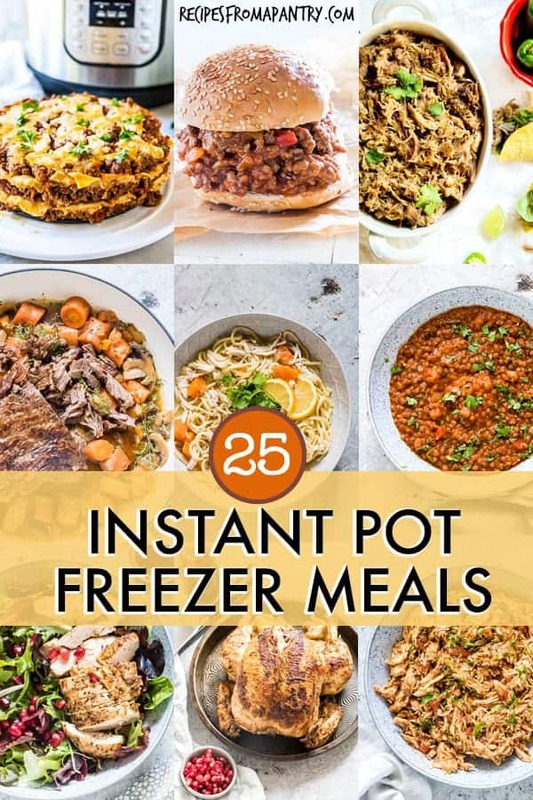 Buy a bunch and cook up all sorts of delicious Instant Pot freezer meals starring chicken. Saving money and getting ahead: two things that are music to my ears. Store food flat. To save valuable space, store your Instant Pot freezer meals in Ziplock bags instead of containers. Make sure to remove extra air before sealing, and lay the bags flat. Label your freezer meals. In addition to the meal name and date, I also like to jot down the directions for thawing and reheating. This will save you valuable time (and brain power) on those hectic days when you need to get dinner on the table fast. Make a list. 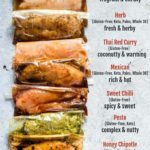 Create a master list of all your freezer meals and post it somewhere handy (i.e. on your fridge door). That way you can easily review what is available without having to rummage around in the freezer. Let the food cool down, then transfer into these Ziploc freezer bags. Store the meal in the freezer for up to 3 months. Remove the meal from the freezer the night before needed and let it thaw in the fridge. For a faster thaw, you can place the meal into a microwave and thaw according to the microwave’s instructions. Transfer the thawed meal into a microwave-safe container and reheat in a microwave. Or transfer into a saucepan and reheat over low to medium heat. Here are some of the items you will need to make these Dump and Start Instant Pot Recipes. Use this convenient cutting board. I use my favourite trivet in the instant pot. These awesome tongs are great for removing the food from the pot. I use these measuring jugs or cups for measuring out liquids. Use these handy bowls with covers. Use please this to check the internal temperature meats cooked in your Instant Pot. Fragrant spices <= that make all the difference. I love these perfect sized meal prep bowls for make-ahead healthy lunches and more. This freezer is great for storing your prep ahead meals. You can’t go wrong with this microwave for reheating your leftovers. So, are you ready to make some easy Dump and Start Recipes? Gather up your ingredients and I will show you how to…. 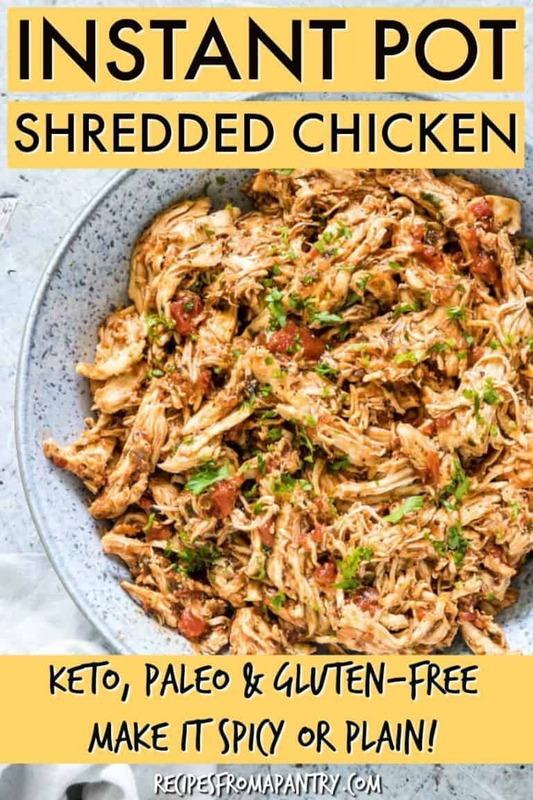 This Instant Pot Shredded Chicken is a quick and easy recipe that sooooo versatile. Whether you serve it on its own, stuff it into tacos, or add it to salads, soups, and stews shredded chicken really is a make-ahead meal MVP. 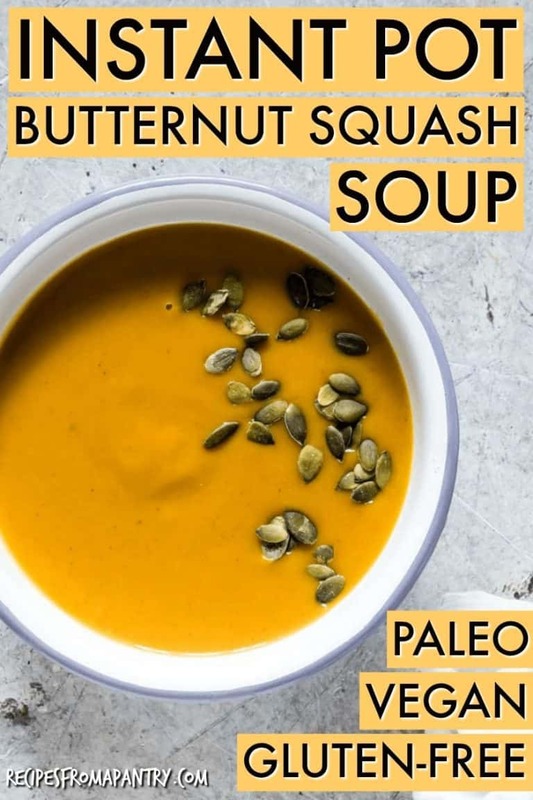 Creamy, flavourful and comforting, Instant Pot Butternut Squash Soup is a true dump and start recipe that is sure to satisfy. You’ll always find at least one batch of this delectable soup in my freezer! This Instant Pot Lasagna is deliciously cheesy, hearty and full of flavor. 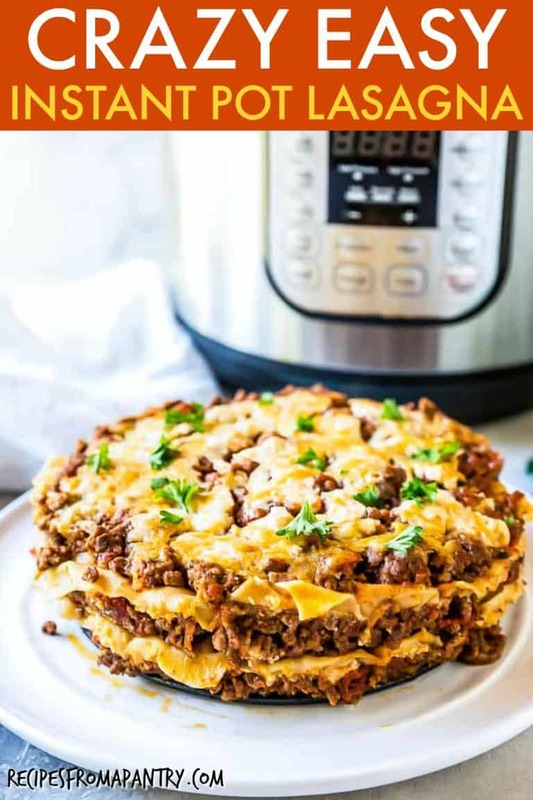 Featuring layers of perfectly seasoned ground beef, noodles, tasty sauce, and (of course) cheese, you will love how crazy easy to make! Every freezer deserves at least one cosy, warm and filling stew. And this Instant Pot Venison Stew is it! 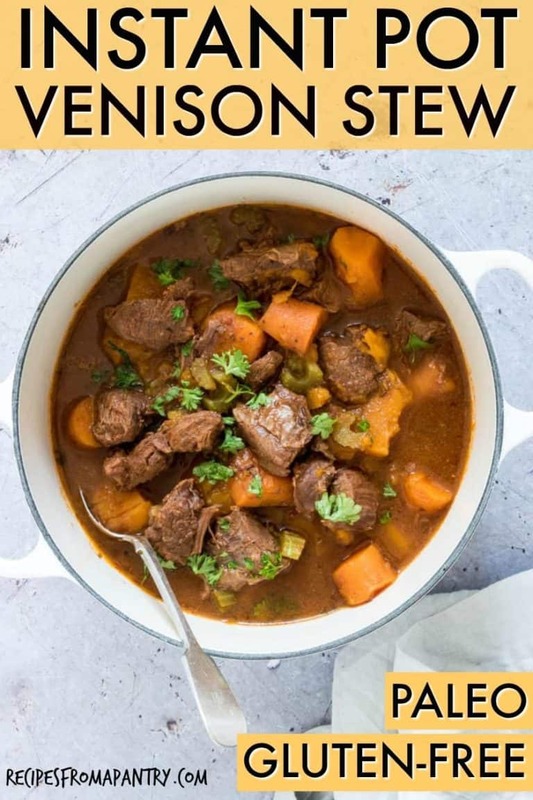 Hearty, flavourful and satisfying, Instant Pot Venison Stew comes together quickly with minimal effort and only a handful of ingredients. 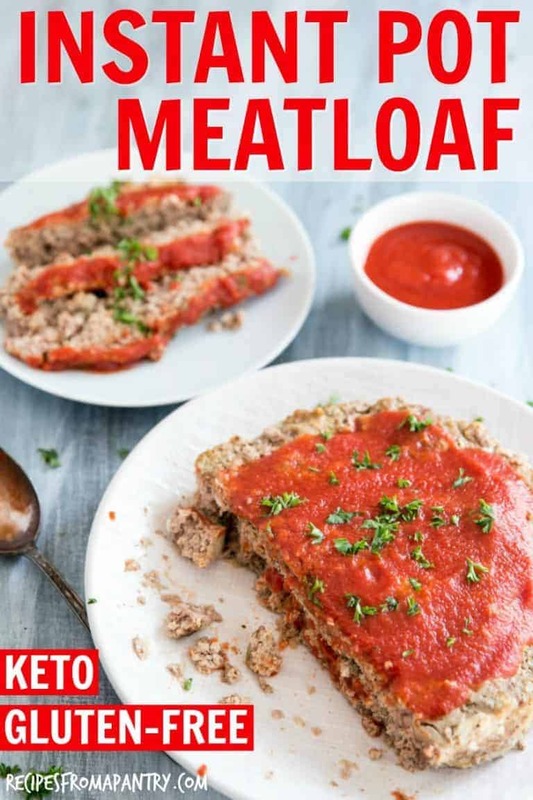 Meatloaf lovers, this is the recipe you’ve been waiting for! Thanks to the Instant Pot, this moist and tasty meatloaf is cooked to perfection in less than 30 minutes. Instant Pot Meatloaf is classic comfort food that truly is quick and easy to make. 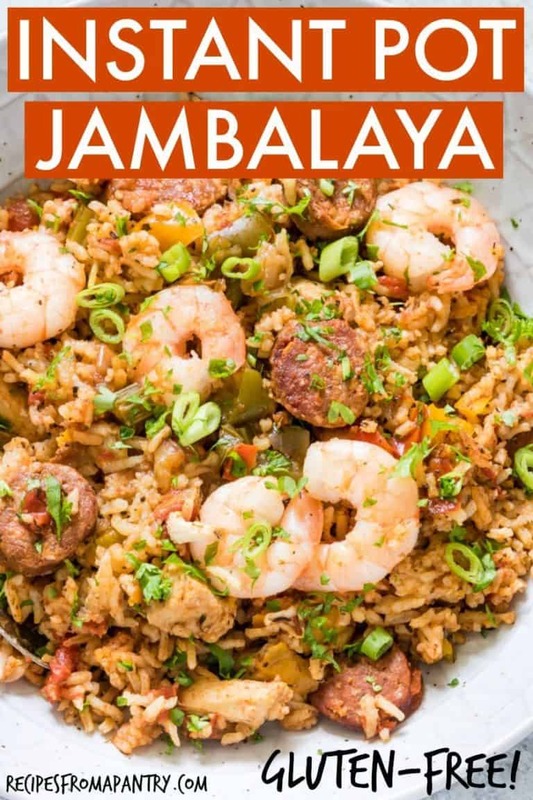 This Instant Pot Jambalaya is a complete one-pot meal that is full of bold flavour. This recipe comes together so quickly and cooks up fast, it is an ideal freezer meal prep solution. 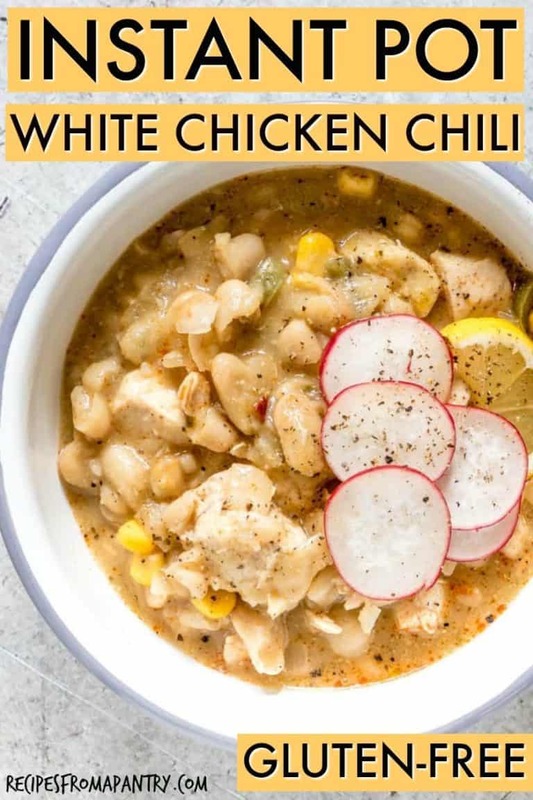 Instant Pot White Chicken Chili comes together in less than 30 minutes using everyday fridge and pantry staples. This is a light and healthy chili recipe that you’ll want to eat all year round! 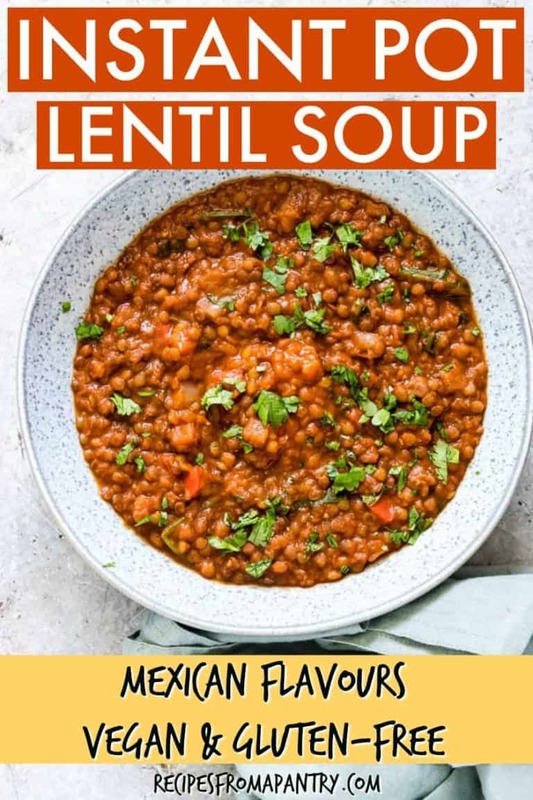 This Instant Pot Lentil Soup is a super easy and filling recipe that is bursting with Mexican flavours. Easy to make, crowd-pleasing flavor and so good for you, Instant Pot Lentil Soup really is the perfect freezer meal solution. 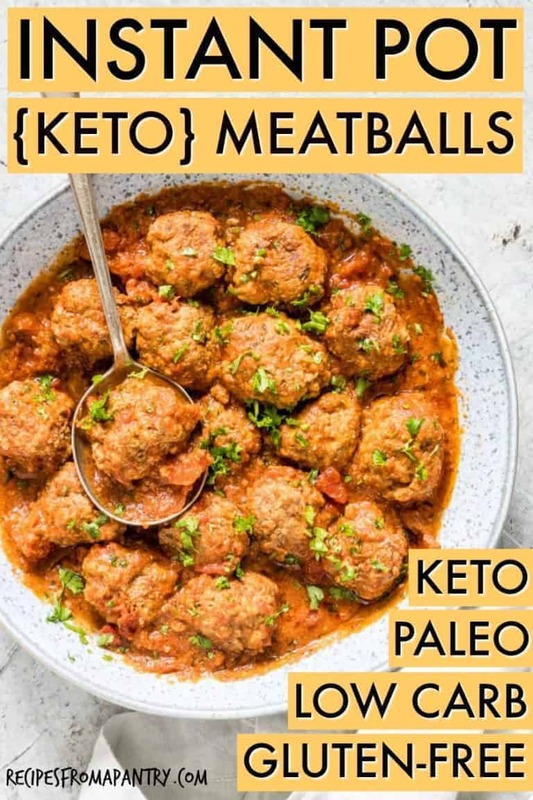 These juicy, flavourful and ridiculously Easy Instant Pot Meatballs are made from pantry staple ingredients and require only a few minutes of cooking in the Instant Pot. This is a super tasty recipe to add to your make-ahead freezer meals repertoire. 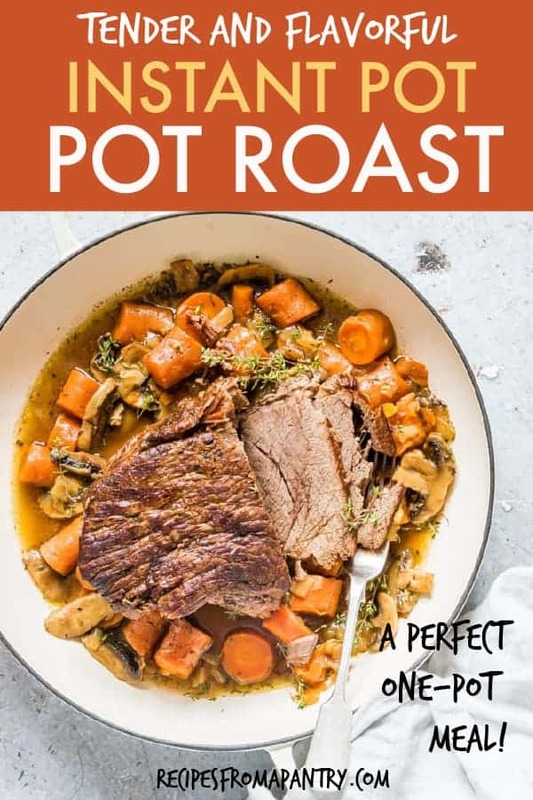 Making Pot Roast in the Instant Pot gives you the most tender, flavourful meat and deliciously seasoned vegetables, all without having to spend all day in the kitchen. Instant Pot Pot Roast is a perfect one-pot meal that is sure to satisfy. 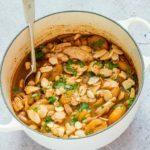 Chilli is one of the best freezer meals around, and this Instant Pot Chicken Chilli is no exception. Full of flavour and easy to make, this is the freezer meal you’ll want to be sure to keep stocked at all times. Mac and Cheese is a beloved comfort food, so it just makes sense to whip up a big batch to freeze and have at the ready. This Instant Pot Mac and Cheese not only boasts an amazingly creamy 3-cheese sauce, but with 5 different preparations to choose from, there is sure to be something for everyone. 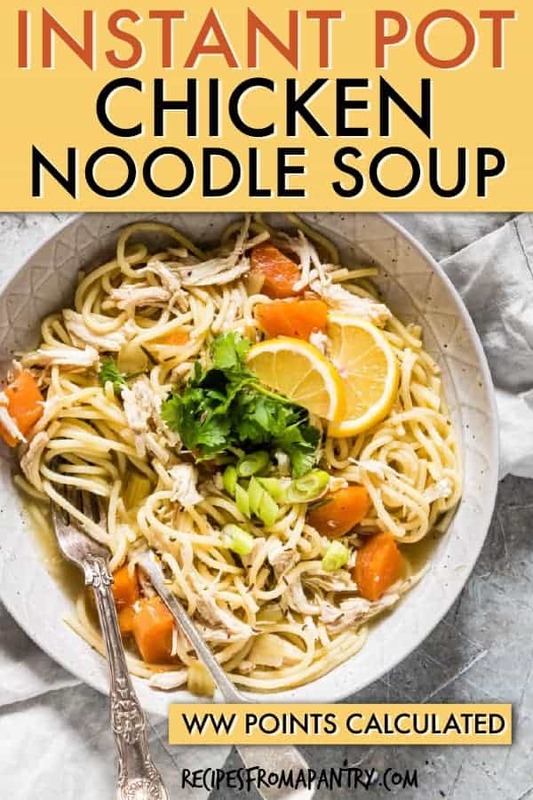 This recipe for Instant Pot Chicken Soup with Noodles is everything you want in a chicken noodle soup: warm, comforting and satisfying. Plus it is so easy to pull from freezer, heat and serve. This is the soup that is sure to cure what ails you! 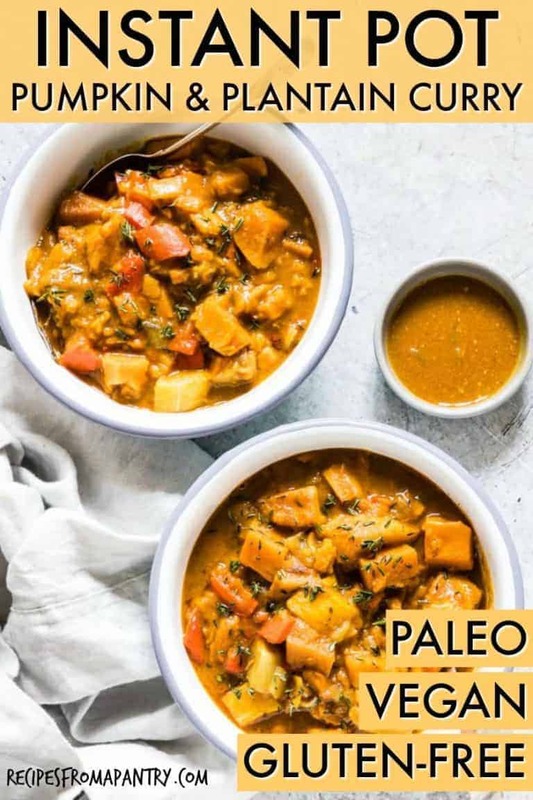 This quick and easy Instant Pot Pumpkin and Plantain Curry is a truly unique dish that blends together African and Indian influence. Vegans and meat lovers alike will simply swoon over this delectable dish that is full of rich and complex flavour. 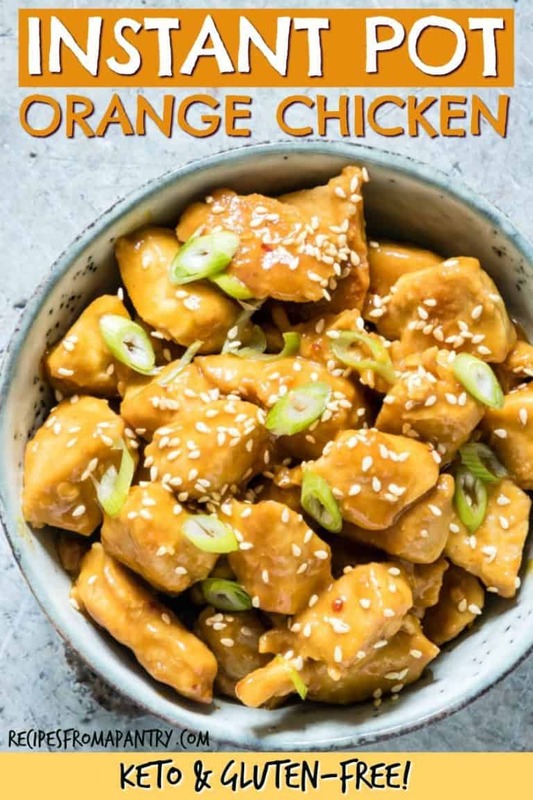 This Instant Pot Orange Chicken recipe is for those who love takeaway, but want to make a healthier, quick and easy version at home. Bursting full of amazing flavour from the orange and spices, you will love how quick you can have this tasty freezer meal ready to serve. 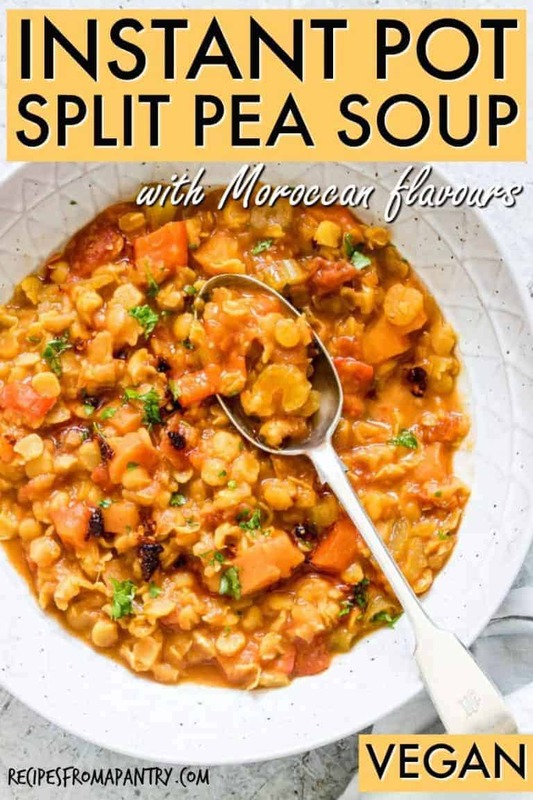 This recipe for Instant Pot Split Pea Soup is hearty, satisfying and full of bold Moroccan flavours like cumin, coriander, cinnamon and paprika. This is a true dump and start soup that is easy to make, easy to freeze, and easy to heat and serve. 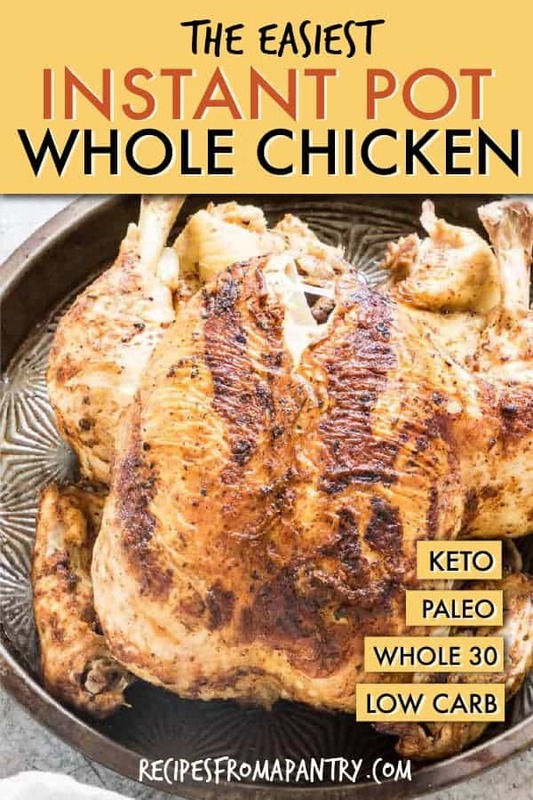 Yeap, you can cook a whole chicken in the Instant Pot! In just 45 minutes you will have perfectly cooked, totally moist and tender rotisserie style chicken. Whether you freeze it whole to serve later, or break it down to freeze and use over time, Instant Pot Whole Chicken is an essential component to true freezer meal success. 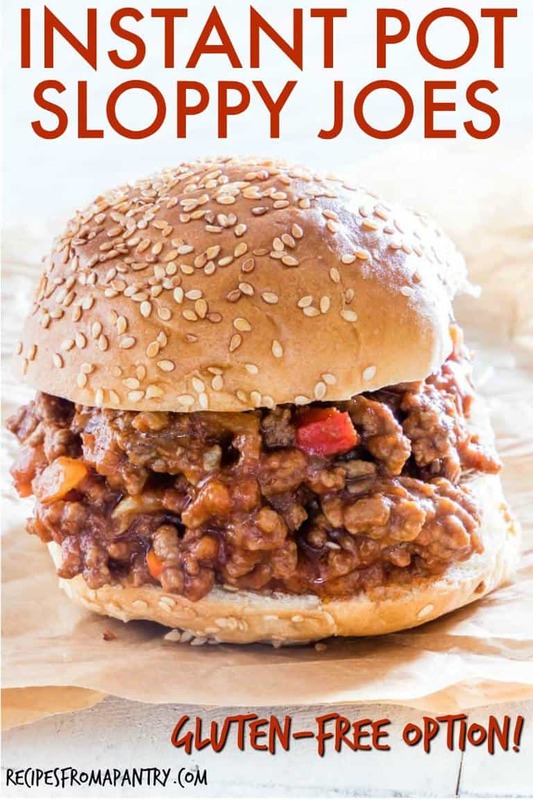 An American classic and fond childhood staple, these Instant Pot Sloppy Joes are even easier to make than the version you grew up with. And it’s so easy to double (or even triple this recipe), you’ll always be ready to feed a crowd. This quintessential beef and bean chili comes together with just a handful of everyday ingredients, and is cooked in just 25 minutes. Stash it in the freezer to heat and serve with a side or rice or cornbread, or dress it up with a whole host of toppings. 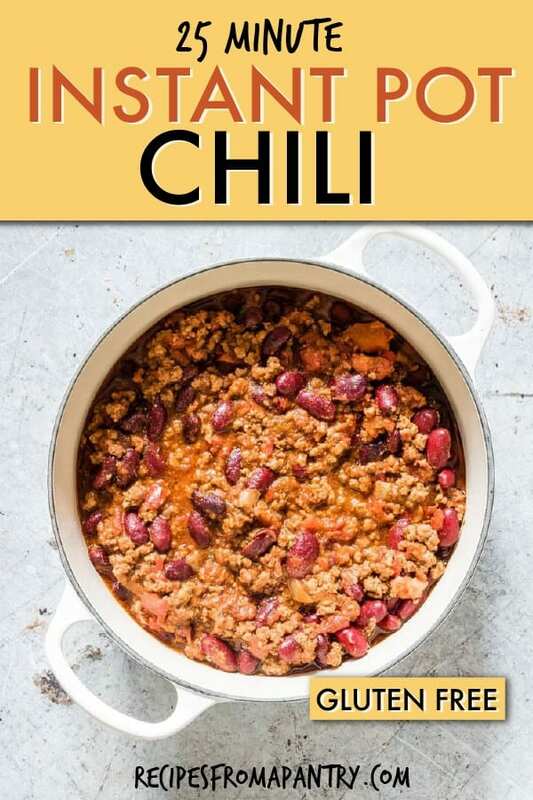 This Instant Pot Chili will soon become your go-to recipe! 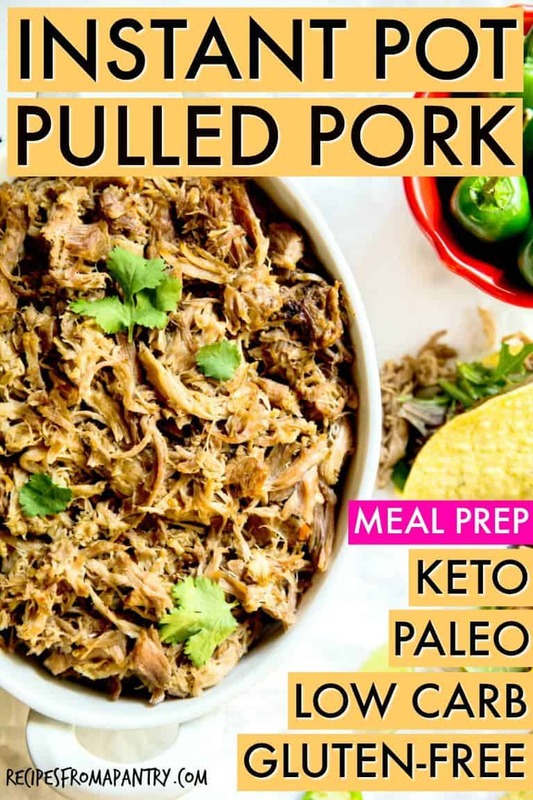 This Instant Pot Pulled Pork is tender, tasty and oh-so-satisfying. 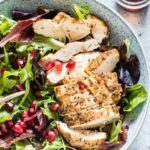 If you’re looking for a fantastic meal prep recipe that is packed with amazing flavour and comes out perfect every time, this is it. 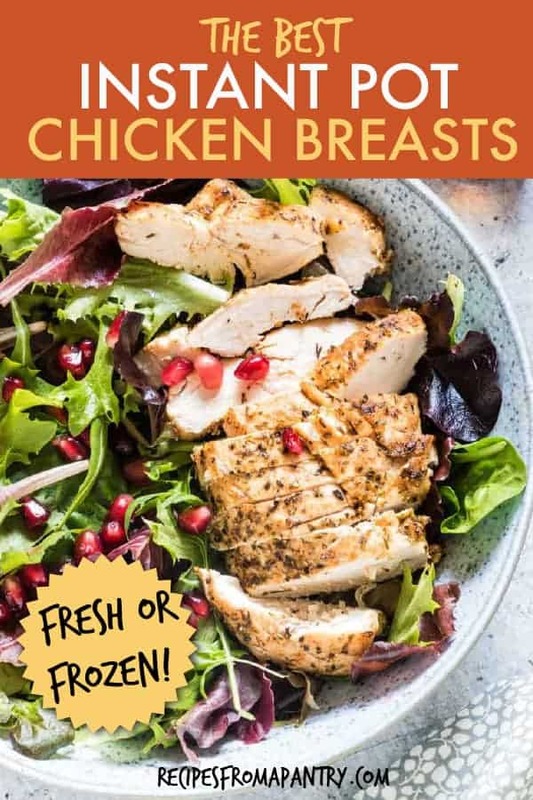 This really is the best recipe for Instant Pot Chicken Breasts. This method produces flavourful, tender, perfectly cooked chicken that is easy to store in the freezer and use in a wide variety of meals. 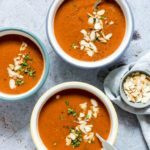 Creamy Instant Pot Tomato Soup is thick, hearty and so comforting. 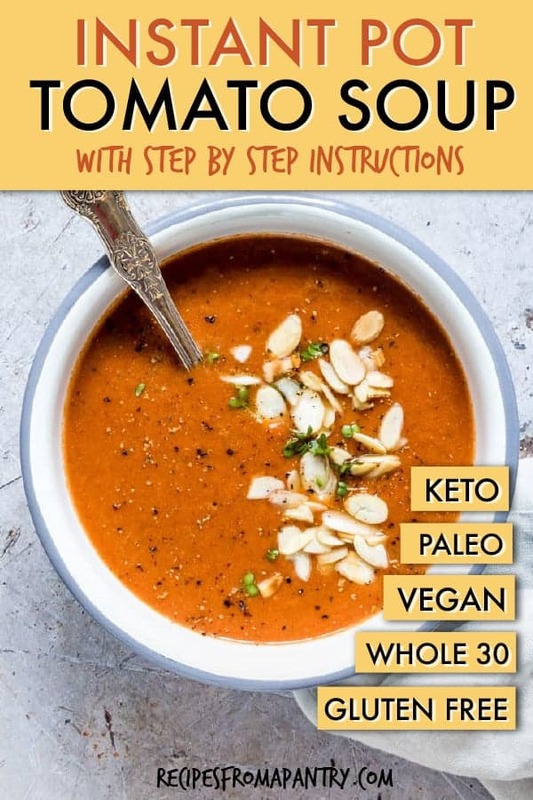 This delicious tomato soup is a healthy dump and start Instant Pot recipe that is made absolutely no oil at all. Cooking quinoa in the Instant Pot is so quick and easy, you’ll never go back to the stovetop method. 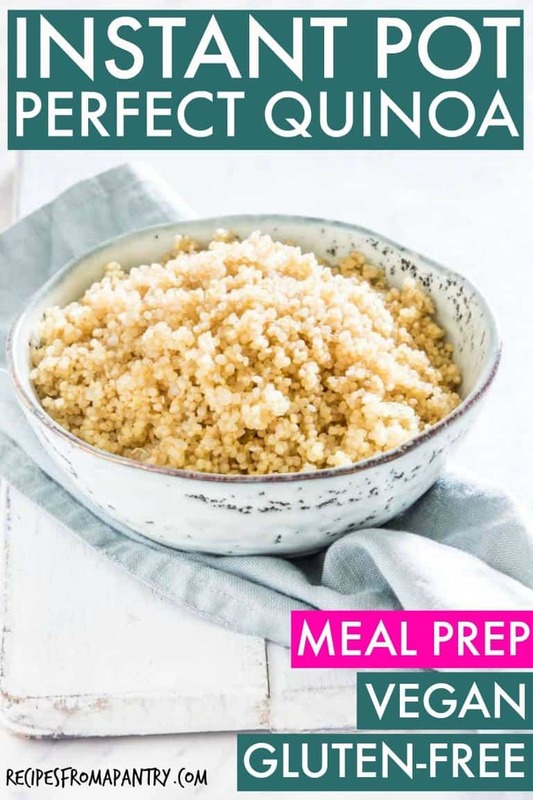 Whip up a batch of this Instant Pot Quinoa, store in the freezer and then use it in soups, curries, salads and more. So tasty and so simple! This recipe shows you how to easily cook up perfect Instant Pot White Rice, Instant Pot Brown Rice, Instant Pot Jollof Rice and Instant Pot Mexican Rice. With a freezer full of these 4 different styles of rice, it is quick and easy to make all sorts of delicious meals. This recipe for Instant Pot Egg Bites is a perfect freezer meal solution. 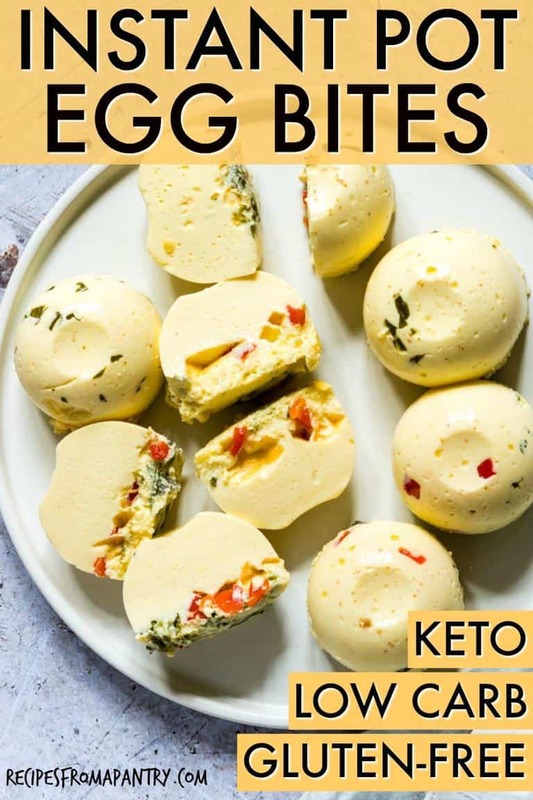 You will looooove how easy it is to make and freeze these perfectly light, fluffy, melt-in-your-mouth egg bites. Just the thing for eating breakfast on the go, make-ahead lunches and more! These Instant Pot Brownies are fudgy, moist, and full of flavour. Easy to make, either freeze whole or cut into individual servings, wrap and freeze. 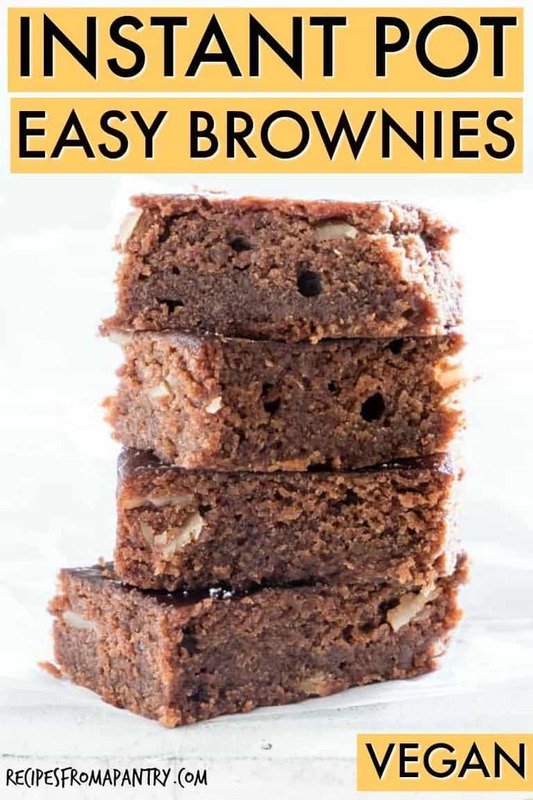 Either way, you’ll love being able to satisfy those chocolate cravings with these delectable brownies. Thank you for reading my Instant Pot Freezer Meals post. And please come visit again as I continue dreaming up recipes, traditional African recipes, African fusion recipes, Sierra Leone recipes, travel plans and much more for you. Thanks for supporting Recipes from a Pantry, UK food blog. So many great recipes in the roundup, can’t wait to try some! I love having a whole list of amazing recipes in one page 🙂 I find that planning and freezing ahead of time, saves time and money. I don’t waste as much. Your recipes sound so delicious. Pinning! So many great ideas for any day! Everything looks and sounds amazing! Totally saving this for later, Bintu. 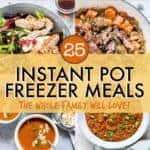 Love all of these recipes; I’m going to put my instant pot to work! 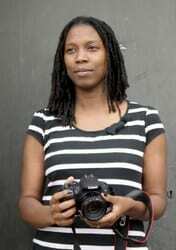 Hi, The blog is quite interesting to read. I believe they are the best ways to grab an immediate attention.